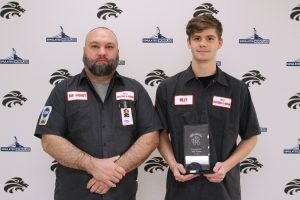 The John Marshall High School Career & Technical Education Students of the Month for December are Billy Holmes and Cody Sprowls. From left: Billy Holmes with Collision Repair teacher Joe Wendt. Billy is a senior enrolled in the Collision Repair program at JM and is the son of Bill and Laura Holmes. He is a member of the National Technical Honor Society and the Drug Free Club. Holmes wants to become an equipment operator when he graduates high school. 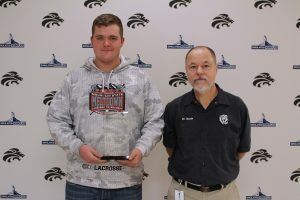 From left: Cody Sprowls with Mill Works teacher Eric Booth. Cody is a junior in the Mill Work and Cabinet Making class. He is thankful for the great teacher and all of the skills he has learned in this CTE class. Cody’s career goal is to become a carpenter or welder. He is the son of Rob and Erin Sprowls.